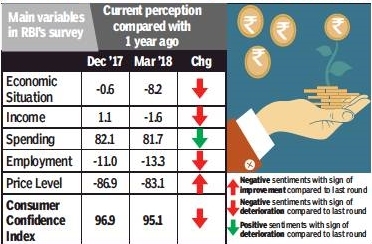 Consumer confidence has waned since December 2017 with respondents to an RBI survey being more pessimistic about the current economic situation and employment opportunities compared to a year ago. The only area where sentiment is in the optimistic zone is in spending on essential and non-essential items. However, here too people are less positive than they were a year ago. The bimonthly RBI consumer confidence survey has two components — the current situation index and the future expectations index. The CSI — or perception of current prices, jobs and overall economy — has remained in the pessimistic zone since March 2017, while the FEI followed the same trend but was not in pessimist territory. “Households’ current perceptions on the general economic situation dived sharply from the neutral level polled in the last round. Their one-year ahead outlook also deteriorated, but remained in the optimistic domain,” the RBI said in a statement. What this means is that while most people believe that economic growth will pick up in 12 months, there are fewer people feeling that way compared to earlier. “Respondents continued to express concern about the current employment situation, and outlook for the year ahead was less positive than in the previous round,” the RBI said. Households’ assessment of the current price situation and the outlook a year ahead have broadly remained unchanged. According to RBI sources, household expectations usually take longer to form (as against professional forecasters). At the same time, once negative expectations of price-rise set in, they take more time to overcome even if the central bank manages to get prices under control. The responses to the survey had gone into pessimist territory from June 2013 when the rupee had crashed during the ‘Taper Tantrums’. After that, they have been largely optimistic since March 2013. They slipped back to pessimism again in the quarter following demonetisation in November 2016 and have been there ever since.